I first saw this project online on Corrnor Franta channel and it was beautifully done. That was also how I found out his channel and subscribed! lol. Recently, when scrolling through pinterest, I came across this melted crayon DIY again so I decided to give it a shot. It may sounds like a kid's project to some of you, but you know, this will go onto a canvas - (don't you think this is artsy enough lol), and the result really depends on your blow drying techniques. It's tricky but easy. I had fun doing this! I bought my canvas and crayon in Daiso. Both for RM10. Idk where else to find a canvas here, and for crayon, it was really a try and error method. (melting point & shape, I guess?) A lot of people that did tutorials on this usually using 'Crayola' brand but it's hard to find it here in Malaysia. Crayola melts easier, faster and smoother. 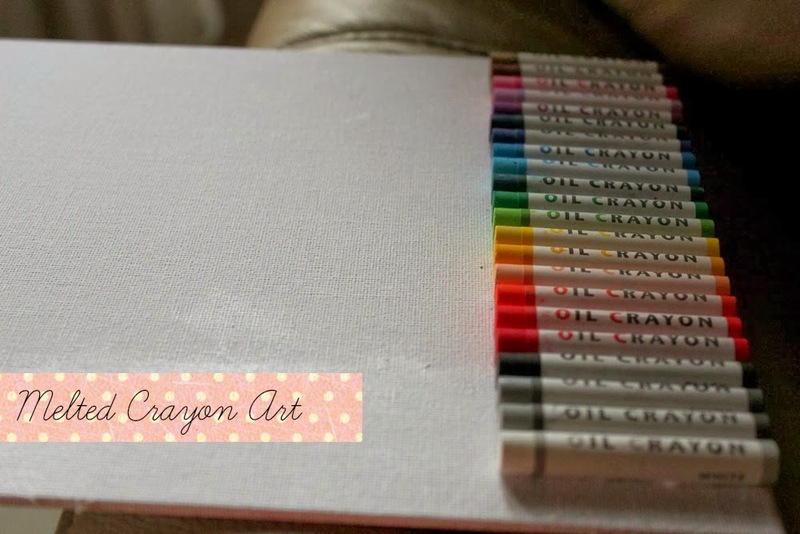 1) Arrange your crayons on one side of the canvas. Do this vertically if your canvas is small. Colours theme is sukehati but keep in mind that some colours mixing can end up with (usually) brown colour. I'd recommend a rainbow arrangement. You can leave the crayons in wrapped or take them off. 2) Stick them on canvas using hot glue gun or any type of glue you prefer as long as they doesn't fall! I used wooden craft glue and it worked just fine. Allow it for an hour for the glue to completely dry. 3) Finally, the fun part - blow drying and watch your crayons melt away. Since I think this part takes forever lol, it also helps having musics while you are doing this. Put your canvas at a slight angle and begin the melting. Aren't different crayons have different melting points? i dunnoe but I think they do. The crayons I used took 8-10 minutes per 1 section, which I set my hair dryer on high setting. A tip here is to point your dryer downward, so the wax will run better. Kalau crayons cepat cair then use low setting instead of high. I find that gold & silver crayons didn't go well with this project. They took longer time to melt. and I'm done! Good luck! hehe.